Sutton Hoo was discovered in the late 1930’s. It’s an Anglo-Saxon burial mound, containing a boat with a burial chamber at the centre. The boat is 80ft long and contains important grave goods. It’s thought that it may be the burial sight of King Raedwald, an important king of the time. Richard was involved with a reconstruction of the burial chamber and the central section of the boat. 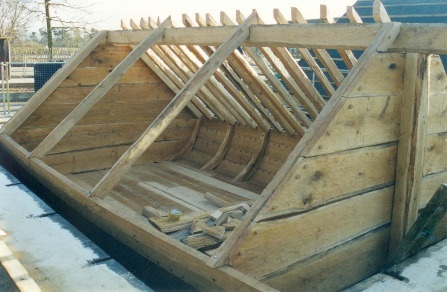 His main job was advising on the details of construction and preparing the timber using Anglo-Saxon techniques and tools. The Sutton Hoo reconstruction – a burial chamber built over the central section of the Sutton Hoo boat, Suffolk. Photo © Edwin Gifford. Richard led the reconstruction of a mid-Saxon building which was built at Bede’s World based on the construction of a Saxon building in Thurlow, Northumberland. He also drew the plans for a second reconstruction of a large timber hall, based on Hall A4 at Yeavering, Northumberland. Flixborough, in north Lincolnshire, was a mid- to late-Anglo-Saxon settlement, populated from the 7th to the early 11th centuries. It was excavated by David Tomlinson and his team from 1989 to 1991, and funded by English Heritage, Humberside County Council, Scunthorpe Borough Council, British Steel, Glanford Borough Council, Clugstons and Rugby Cement. The settlement included the remains of about 40 buildings, with large well preserved refuse deposits that provided an unprecedented view of the life of the settlement. Richard developed plans for some of the buildings, and suggested wall types (based on post holes, foundation trenches and post-pads). There were earth-fast post structures, earth-fast posts paired across the building, base-plates both above and below the ground, buildings with a combined post-in-trench and post-hole construction and deep trenches that would have supported post-in-trench construction. Loveluck C and Darrah R. The built environment: the buidelings, aspects of settlement morphology and the use of space. Chapter 3. In: Loveluck C, ed, (2007). Rural Settlement, lifestyles and social change in the first millennium AD: Anglo-Saxon Flixborough in its wider context. Excavations at Flixborough volume 4. Exeter, Oxbow Books. 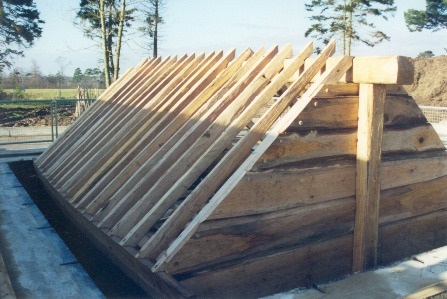 During the excavation of an Anglo-Saxon palace near Hereford in 2000, Richard was filmed making a reconstruction of a mortar mixer for Time Team. Richard made a reconstruction of a Saxon shield for Time Team in 2001. The episode was based around the excavation of an Anglo-Saxon cemetery in Lincolnshire. See Time Team Series 8, episode 1. Richard was filmed making a reconstruction of a Saxon hut for an episode of Meet the Ancestors for the BBC.